The image, status, and stature of the magistrate in the course of performing the duties of his office commands respect—and no pose is more riveting than that of the orator. L’Arringatore (“The Orator”) is a hollow-cast bronze statue that was recovered from Lake Trasimeno in 1566. The statue is an important example of bronze sculpture in later first millennium B.C.E. Italy and indicates the gradual Romanization of Etruscan art. The life-size statue depicts a draped adult male, standing with his right arm outstretched. The figure adopts a frontal pose with a slight contrapposto stance (contrapposto refers to the figure shifting his weight onto his right leg). Based on the inscription on the statue, the figure is identified as Aulus Metellus (or Aule Metele in Etruscan). He is clearly a magistrate and his posture seems to be that of the orator who is in the process of addressing the crowd. He wears a tunic over which is draped a toga—the formal attire of the magistrate. The toga is wrapped around the body, leaving the right arm free. On his feet are the high boots that were commonly worn by Roman senators. His expression and slightly opened mouth make him a compelling figure. The statue was originally erected by the community in honor of Aulus Metellus. 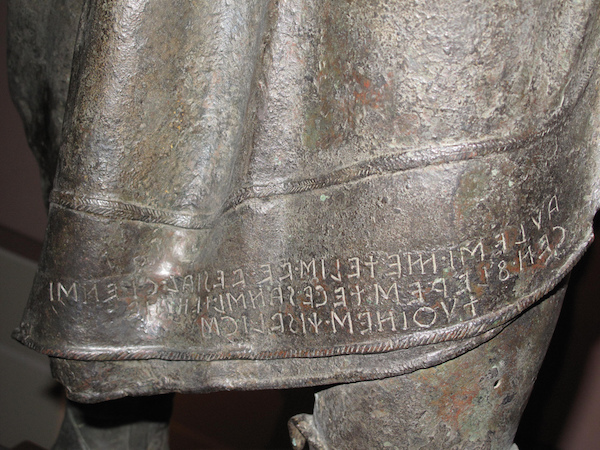 The lower hem of the short toga carries an Etruscan inscription: “auleśi meteliś ve[luś] vesial clenśi / cen flereś tece sanśl tenine / tu θineś χisvlicś” which can be interpreted as reading, “To (or from) Auli Meteli, the son of Vel and Vesi, Tenine (?) set up this statue as a votive offering to Sans, by deliberation of the people” (TLE 651; CIE 4196). The statue of Aulus Metellus offers us a glimpse of the changing socio-political landscape of the Italian peninsula during the latter first millennium B.C.E.—a period in which sweeping change brought on by the hegemonic fortunes of Rome and its booming population, signalled profound and lasting change for other Italic peoples, including the Etruscans. As Rome’s territory expanded during the fifth through first centuries B.C.E., her neighbors were gradually absorbed into the sphere of Roman cultural, economic, and political influence. Some groups, of course, resisted in one way or another, while others gladly “joined up” through political and military treaties and through adopting a Roman lifestyle. This process of acculturation–or Romanization, to use a term that is considered outmoded by some scholars—means that cultural heterogeneity becomes less visible in the archaeological record, replaced instead by a more homogeneous cultural model. These were the fortunes of the Etruscans—as the autonomy of the various Etruscan states eroded, the Etruscans themselves elected to adopt the trappings of a Roman culture that was, in turn, indicative of wider, pan-Mediterranean dynamics. Etruscan art, politics, and even language gradually slipped away. Thus L’Arringatore is one of our latest surviving examples of a sculptural masterwork that still demonstrates the traits of an Etruscan workshop, all the while packaged for an increasingly Roman world. The statue clearly wears the short toga exigua (a kind of narrow toga) and senatorial boots that come from the Roman sphere. He is posed as an orator—highlighting his political career as both Etruscan and Roman aristocrats did. His haircut is in keeping with those of Roman aristocrats and his face may betray some evidence of the verism (truthfulness) popular among Roman elites of the late Republic. The statue still carries an inscription in Etruscan, though, and the working of the bronze is in keeping with the tendencies of Etruscan craftsmanship. Surely the historical Aulus Metellus witnessed a world that was changing rapidly and this statue that carries his inscribed name still bears silent witness to the patterns and dynamics of socio-cultural change in the Roman Mediterranean. L. Bonfante, Etruscan Dress (Baltimore: Johns Hopkins University Press, 1975). G. Bonfante and L. Bonfante, The Etruscan Language: An Introduction, revised Edition (Manchester: Manchester University Press, 2002). p. 183 no. 66. A. Corbeill, “The Republican Body,” in A Companion to the Roman Republic, edited by N. Rosenstein and R. Morstein-Marx, 439-456. (Malden MA: Blackwell, 2006). T. Dohrn, Der Arringatore: Bronzestatue im Museo archeologico von Florenz (Berlin: Gebr. Mann, 1968). Cite this page as: Dr. Jeffrey A. Becker, "Aule Metele (Arringatore)," in Smarthistory, August 8, 2015, accessed April 21, 2019, https://smarthistory.org/larringatore/.